ReadySuite 6.1 is released and now available to download. We recommend all customers using previous versions update to this release to benefit from new eDiscovery scripts, performance improvements, and increased stability. This release contains new LAW PreDiscovery platform support, introducing the ability to retrieve data from LAW directly and bridge fields, images, native, and text files to Relativity. We previously covered the new LAW feature set on this blog post. To see a full list of changes in ReadySuite v6.1.0, release notes can be found here. Now, let’s take a quick look at some of the new features. We’ve improved our built-in script editor adding features designed to develop your own custom scripts or modify ours with greater ease. The new editor allows for code completion, parameter list and hints, quick information popups as you hover over code, and information tied directly to our scripting API. We’ve also added a find & replace dialog to the script editor – as seen below. This should explain itself, but will help avoid having to copy/paste to a separate editor just to make some quick changes to a script. Lastly, a new navigation bar was added to the top of the script editor – allowing you to easily navigate to different members and pieces of your code. A new option was added to the Script Browser allowing you to mark scripts as Favorites. Click on the star icon next to each script to toggle the script’s favorite status. A list of your favorite scripts will then be accessible from ReadySuite’s main ribbon toolbar. 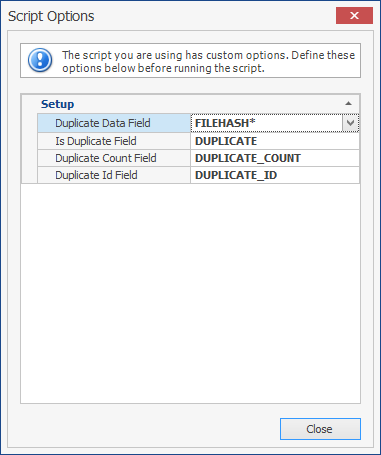 Searches for duplicate documents based on values from a specified field, such as a MD5 or SHA-1 hash field. Populates fields containing data for ‘Is Duplicate’, ‘Duplicate Count’, and a ‘Duplicate ID’ field that can be grouped. Specify a field containing either a BegAttach, ParentID, or GroupID to assign family associations and links to document records. Use this script to clear / forget the loaded family associations and links from document records. Use this script to assign a static page template file as the page image to documents. Useful when combined with ‘Export Documents’ to create a new or modified volume set. 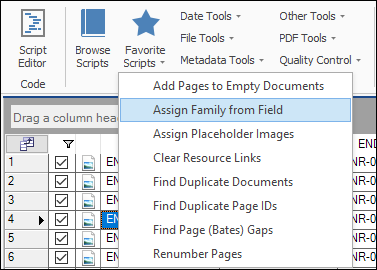 Use this to add page stubs to documents based on a field containing a page count value. Useful when you do not have an image-based load file but need to create a BegDoc/EndDoc range for documents. 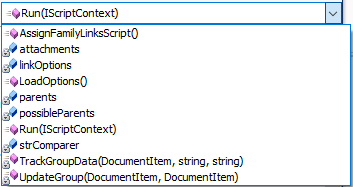 Use this script to clear / forget the resource links for native, page, and/or text files. Checks for and reports on duplicate page identifiers for the pages loaded in documents. Checks for and reports on gaps in page and bate number ranges for the loaded documents. Use to renumber page (bates) identifiers, and, optionally rename page files to match new numbers.